hooray: dreams that you dare to dream really do come true. Wouldn't you love to see this hanging on your wall everyday? If only it were for sale. I like this. It will be wonderful to have it on the wall, to remind us that dreams really do come true. I just reblogged this over on your Tumblr. Isn't it just amazing, it reminds me of my favourite film You've Got Mail and the soundtrack (oh dear I just admitted that!). 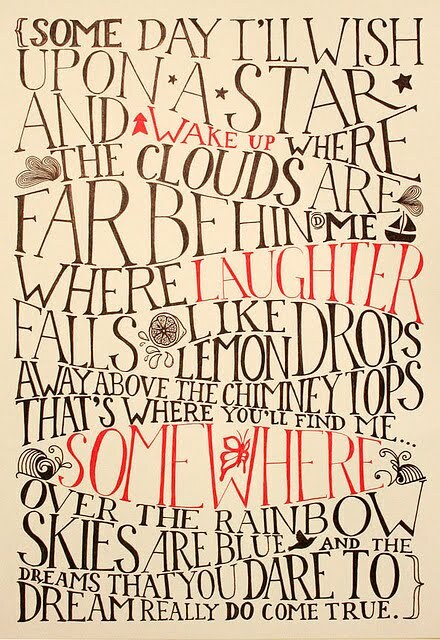 I had this song as our first at our wedding and would love this print in my office. i loooove this song! this is so sweet! I would buy this for sure!! Yes I needed this right now. Love. Absolutely would I love seeing this on my wall. I've been seeing this around the internet a lot within the past week. It's so positive and pretty! I followed a link from Pinterest to this print. I can find it on your blog, but not for sale anywhere. Have you had any luck?